I can assure you that both the product - and service you receive will be of the highest standard. I have been selling jewellery on Ebay - as well as fossils and meteorites for several years - and in that time I have received NOT ONE negative feedback. On Ebay alone - as of March 2009 I have received over 4000 positive feedback. I think that says something about the way I treat my customers. 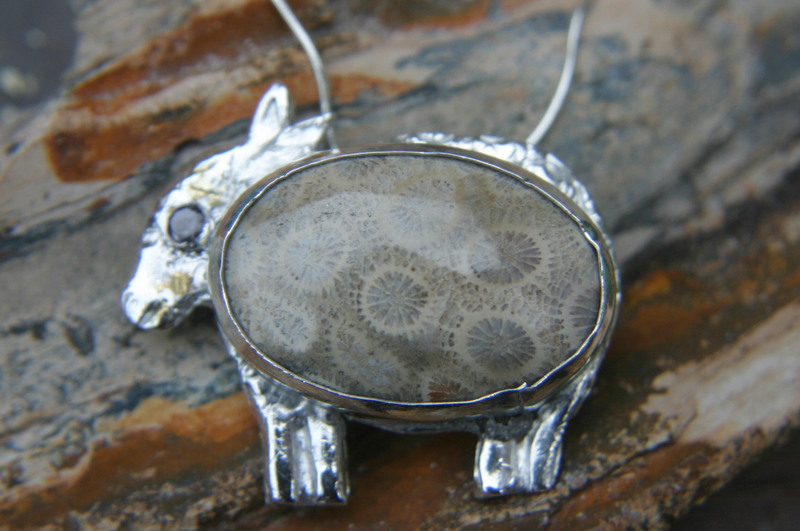 I made this as a special commission for a customer whose partner was training to be a sheep farmer at Agricultural College and he wanted a piece of sheep jewellery for her Birthday. I had an idea that some Fossil coral cabochons look quite like wool - and it grew from there! The sheep arrived at nine this morning, and he looks grand!! Baaaaah-rilliant, in fact. I wanted to email you sooner, but our main computer still doesn't work so I wasn't able to until now. Thanks for giving us the tracking number!! I ripped open the package and took a peak at it, it looked wonderful!! By the time I presented it to Lizzie, at 12:30, I had shown everyone else behind her back!! It really is a great achievement, clever design and an excellent finished article. He's a great little fella and has been welcomed as part of the family!! He's a very likable little character. You were absolutely right about the coral, it does look woolly!! Lizzie has always taken an interest in fossils, so that was an added bonus! Simple, but delicate with lovely materials and a charming design. He isn't at all bling, he looks like he's come down off the fells, but in extremely good condition! Plus, Lizzie likes it as much as I do and was very grateful. Thank you very much for the photos as well; you've gone to a lot of trouble with this little chap! It's Lizzie's party this evening and the sheep will be attending! 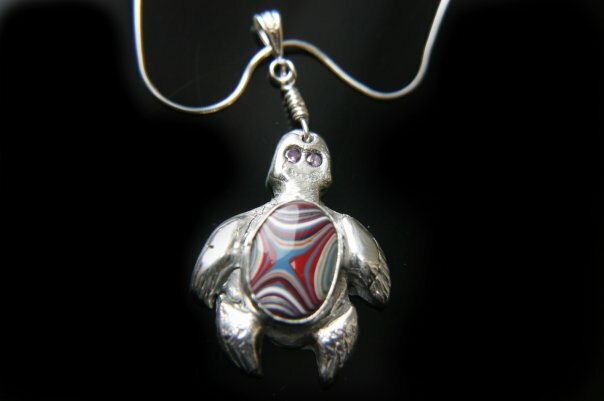 Silver Turtle Necklace - With Fordite Cabochon. A customer commissioned this piece as she wanted something inspired by a lovely drawing of a turtle her Daughter drew for her. we discussed ideas and thought it would be fun to use a cabochon of Fordite as it is reminiscent of the shapes in turtle shells. This is what she had to say when she received it. I just want to let you know, that I received both necklaces today. I am so pleased with my turtle necklace, it is more beautiful in person than even in the picture. I have already put it on and it looks great! Thanks for all the time and effort you put into it. Your craftsmanship is wonderful. Savanna loved her little star necklace! I was going to put it in her Christmas stocking, but she is inpatient like her mom. LOL. I sold 2 of these to a customer, I assume as Christmas gifts. This was to be an Iron Wedding Anniversary present. I made up an information sheet on the meteorite and a nice display box. Thank you for the Nantan pyramid and the extra information you provided. This will make a fabulous present. I have never before dealt with an online trader who goes to as much trouble as you do; I really appreciated the advice and guidance you gave me. I know exactly where to come next time I'm looking for an unusual and beautiful gift! I'll just say what I think of the pendant. It's beautifully made and the meteorite fragment makes it a real spaceman! It's just a really unusual and beautiful pendant. I had an order for 2 pieces of Fordite jewellery for a customer's Mother. I made 4 pieces up for him to choose from and he told me which he wanted. This and another piece were posted out the same day Special delivery. Many thanks once more for all your help and speedy service !! If only BT & British Gas could run their businesses so effectively !!! 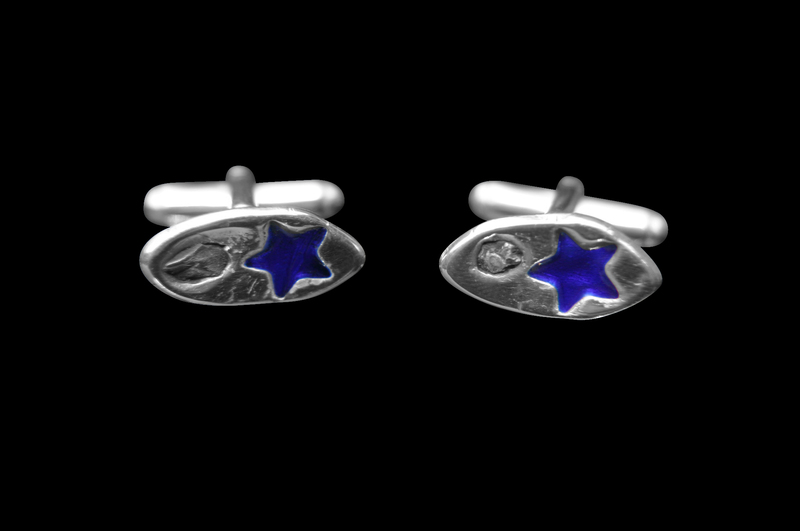 I had a special order from a customer who wanted a pair of cufflinks made up in a specific colour for her Husband. She needed them urgently for his Birthday. I made the cufflinks up quickly for her and posted them Special Delivery to ensure she got them the next day. Thank you so much for doing everything as promised. The cufflinks are perfect and arrived really early in the morning. We are all really impressed with your talent and craftsmanship. I supplied one of these to a customer as a gift for his Mother. He needed it urgently as it was her Birthday the very next day so I received the order, packed it and posted it within an hour so I could reach the Post Office before it closed. This is the message I received from him. 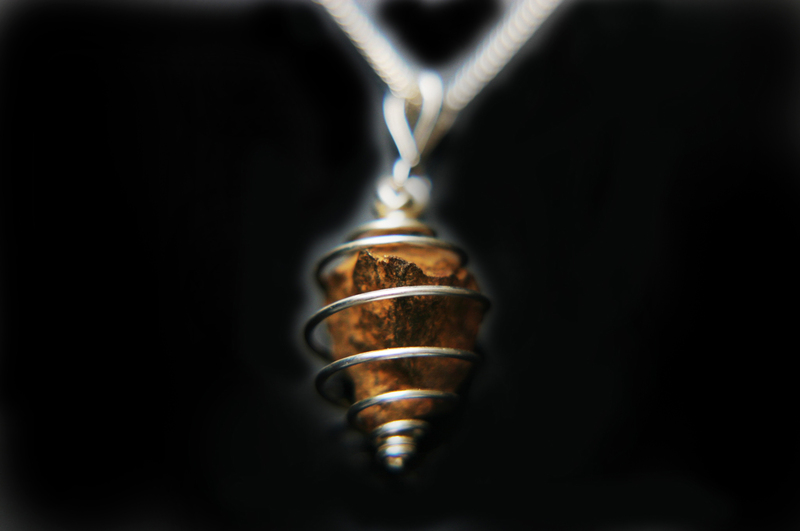 I gave Mum the meteorite pendant (that you kindly rushed together!) on Friday the 19th. It arrived on time and I was very pleased not only with the friendly and extremely efficient service, but with the quality of the jewellery itself. The pendant is very nicely crafted! 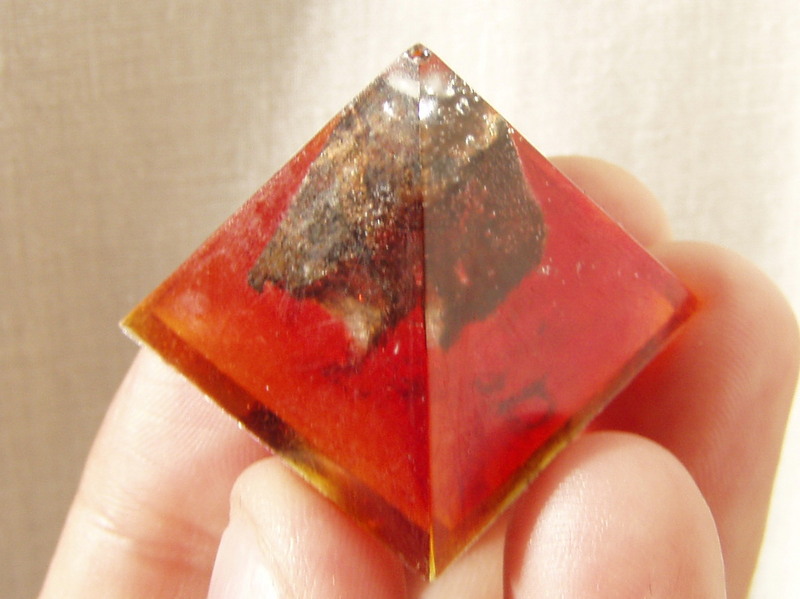 Too often, other 'meteorite jewellery' that I've found on the web is fairly cheap-looking, uninteresting stuff, with a meteorite stuck in the middle just as a novelty. Your jewellery is of an excellent quality and design, with the meteorite feature complimenting it and adding to its appeal. A big thanks! 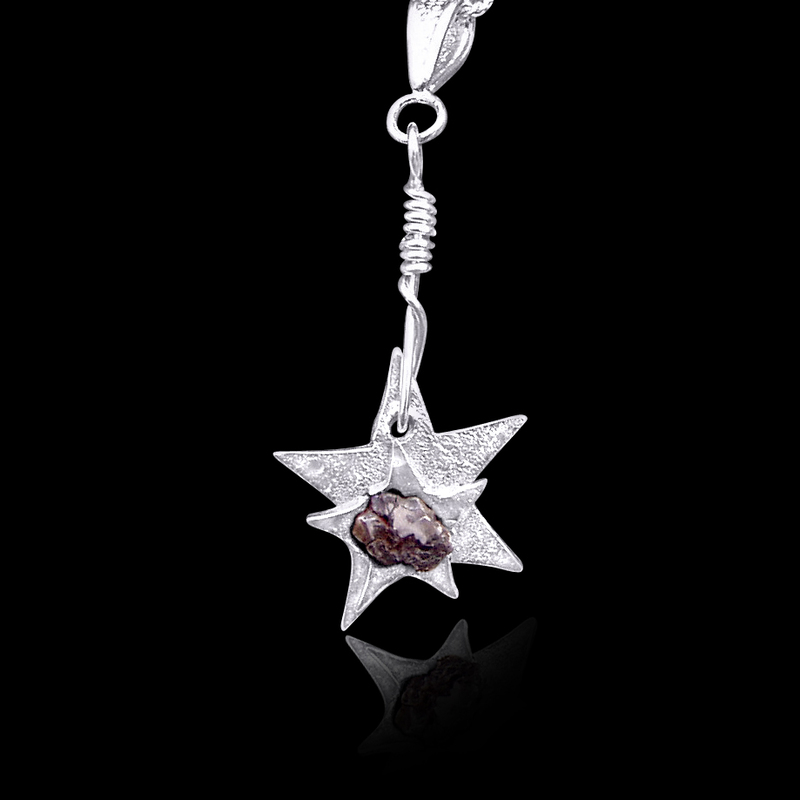 Mum was very pleased with the pendant and said that it is 'out of this world'! I supplied one of these for use as a leaving present for a University Tutor leaving her department. It was sent specially customised - with an initialled silver tag and personalised certificate. This is the response from the recipient - Dr Annie Pullen. 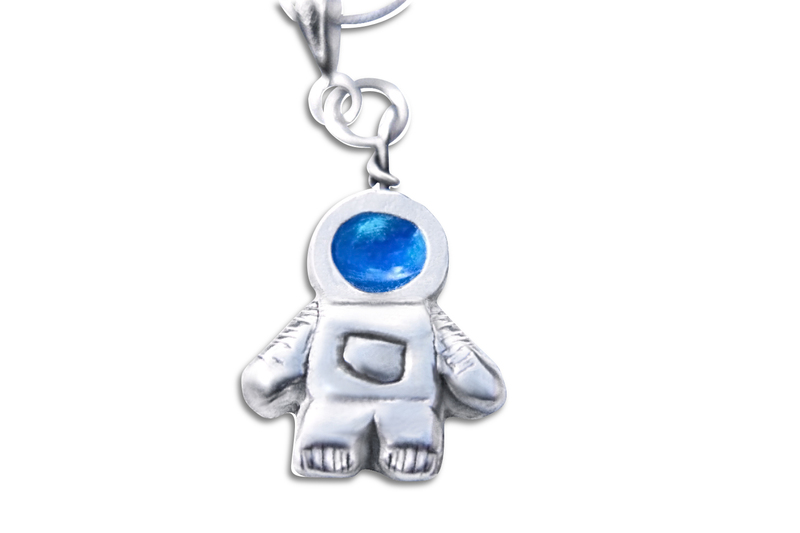 Ordered the spaceman pendant as it looked uniqe, I had not seen anything like it elsewhere and when the item was received I was not disappointed – it is fantastic. 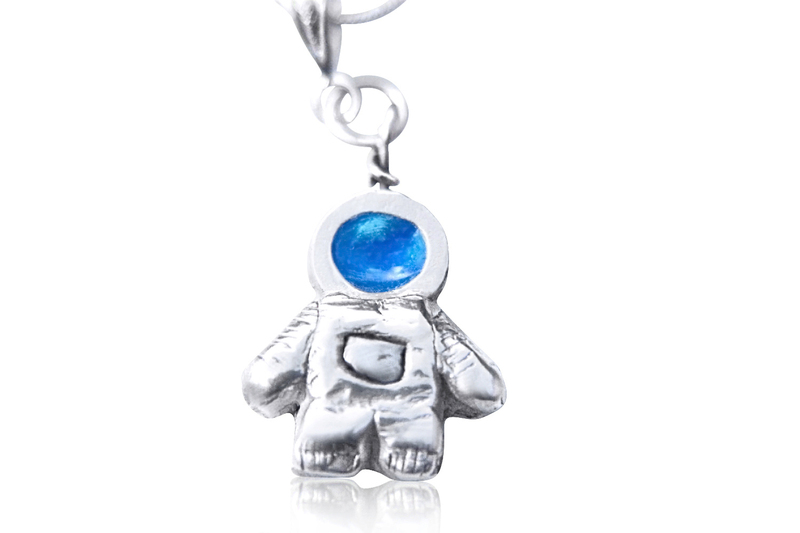 It is a surprising weighty item but not too large or bulky and the chain is a nice thickness , the style of the item is very retro and the blue face really sets it off , as does knowing it contains a piece of real meteorite . All in all great service , quick delivery and 100% satisfaction with the spaceman , now looking at other items for Christmas presents , they are that unique. Many Thanks for the Ammonite and silver necklace, it arrived very promptly the very next day. I am delighted, it will make a great present for my Daughter. I sold a ring recently that was to be used as an Engagement ring. Beautiful pendant and quality craftsmanship. Perfect ammonite! Excellent seller! Thanks so much! Very satisfactory. Unusual and attractive jewellery and very speedy delivery. Fast delivery, friendly ebayer, most highly recommended. Thank you !. Quick delivery, good condition... Tickety-boo. Thanks again! Items as represented; terrific transaction; customer-minded seller! Recommended! Smooth transaction. Pretty pendant! Thanks!. Fast +trouble free transaction many thanks!!!!!!!!!! Product as described, well packaged and fast shipping. A+ and Thanks! Excellent example shark tooth. Quick delivery! Great communication and extremely fast shipping, thank you! View our full profile in the FreeIndex Jewellery Design Directory directory.